This is a fabulous, vegetarian party appetizer where you hardly miss the meat! The wholesome mushrooms cooked in the sherry and fresh parsley and garlic is a delicious, French way of cooking these mushrooms. Coupled with cheese and baguette, you are truly eating like a Parisian! If you are not a big fan of the tanginess of goat cheese, feel free to substitute with brie cheese (also a lovely combination!) for a more mellow taste, or even thinly sliced swiss cheese. In a large saute pan, melt the butter with olive oil over medium-high heat, until frothing (but not smoking!). Add the mushrooms and cook while stirring frequently, until just cooked through and beginning to brown (approximately 3-5 minutes). Now add the garlic and cook for 1 minute longer, or until fragrant. Add the sherry, paprika, parsley, and lemon zest, and stir for 30 seconds, or until most of the liquid is absorbed into the mushrooms. Season with salt and pepper. Note: Do a taste taste after you think it is done, and add more salt and pepper as desired.. Set aside. 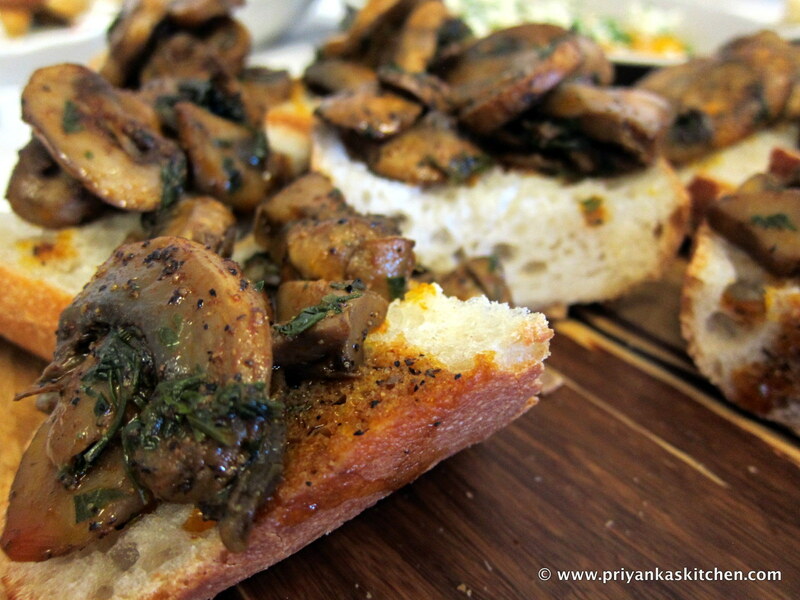 Spread goat cheese on each slice of baguette and spoon about a tablespoon of the mushroom mixture on top of each slice. Pair it: with a great glass of Chardonnay! This entry was posted in Fancy Dishes to Impress With!, Finger Foods, Heart-Healthy, Kid-Friendly, Quick Snacks, Tapas, Vegetarian by priyankaskitchen. Bookmark the permalink.